← Breastfeeding in Public: Get over it. A resolution I am sure to break. It happened again. The calender ran out and I had to buy a new one. This New Year was unlike most in the recent past. We stayed home and partook of a family night complete with Monopoly (I won) and home made party hats. The Max was growing bored around ten o’clock and I figured he would soon fall asleep. 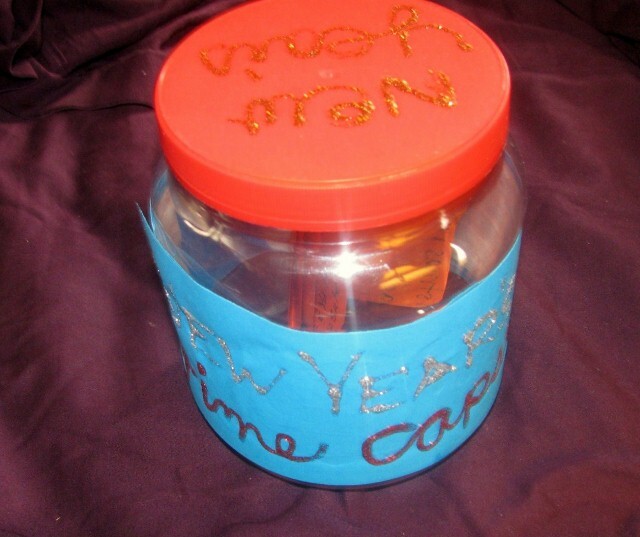 So, I decided to create a New Year’s time capsule. We drug out the craft supplies and went to work on a new tradition I hope we continue for a long time. Inside is a piece of paper listing all the things we liked best about 2011. Of course it began with the arrival of Lucy. Also, our trip to New Mexico was a highlight. Around a dozen events made the list of the Pilver Family’s favorites. I figure we can do this on or around New Years every year. Someday we’ll have a bunch of pieces of paper with things we loved about each year listed inside a decorated old Skippy container. 1 Response to A resolution I am sure to break. I am a total minimalist living with a man who collects hobbies. 95% of the stuff we own is gear to support his many interests. We are fully equipped to camp, hike, tie trout flies, fish, hunt, build models, train kung fu…but I own next to nothing, so it all balances out. And the less we own, the easier it is to keep things clean. I start to get really fidgety when things get cluttered.